A missing puppy’s corpse has been found tied to it’s owner’s garden gate days after sadistic burglars broke into the property. 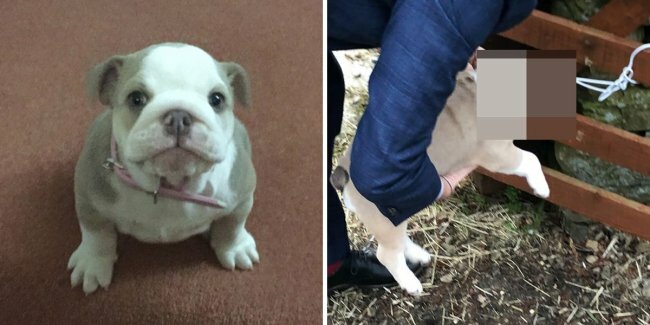 Owner Gemma Knowles, 31, had launched an appeal to find her 12-week-old British bulldog, Wilma, who she believed was taken during the burglary on Tuesday. But the mum-of-three, of Darwen, Lancashire, was left heartbroken when she discovered the puppy’s corpse hanging in her front garden two days later . 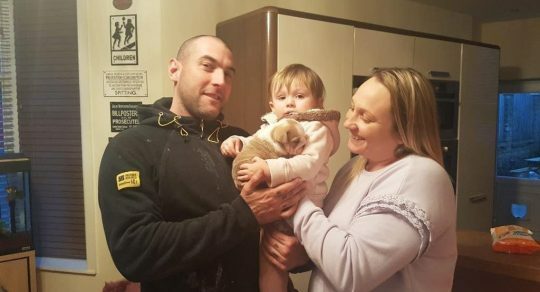 Gemma and partner, Andrew Bolland, 36, desperately attempted to revive the puppy with CPR, before they realised that that their beloved pet had already passed away. The couple’s three children, Penelope, two, Josh, 10, and Dominic, 13, had been asking for a puppy for years and are said to be so traumatised that they don’t want to live in their home anymore. Gemma said: ‘We’re all absolutely devastated. We’re heartbroken. ‘We’d only had Wilma for three weeks – we bought her because the kids had been begging for years for a puppy. ‘I just can’t believe somebody would do this to us. The kids were so scared and so upset – my son doesn’t even want to be here in the house anymore.’ Gemma said the burglars broke down the back door shortly after she left for work on Tuesday morning. They stole the family Mercedes – which has since been found dumped at a nearby estate – and £40 of her son’s pocket money, along with poor Wilma. Teaching assistant Gemma believes the dog was stolen due to its street value of around £4,000. But she thinks the robbers were scared of the attention her Facebook appeal received, which garnered 550 shares. ‘This is a nice area and nothing like this has ever happened while I’ve been here,’ she added. ‘There is no reason for anybody to do this to us – we’re a quiet family, we keep ourselves to ourselves really. ‘I think they must have taken the puppy to sell for cash but then got scared off by the attention on social media.’ Police were called to the scene and are said to be investigating the incident. I am shocked and appalled by the heartless thieves actions. My thoughts go out to this poor family. I hope the perpetrators are caught and punished for carrying out this senseless act. I sat here yesterday morning after reading this story in tears. I was so so upset I cannot start to imagine how the family felt. How can someone be so cruel. I hope someone has CCTV camera in the area. We have MORE crime and LESS police. How the hell are we suppose to cope with all this crime. What will they do when they catch them just a slapped wrist. So is it that crime pays ? I so hope that what goes around comes around. This is one story that really has upset me.